During the Spanish-American War, U.S. forces in the Philippines and Filipino forces led by revolutionary leader Emilio Aguinaldo had a common enemy in Spain. As hostilities ended and the United States emerged from the war victorious, Aguinaldo and his supporters were eager for Philippine independence. However, as a result of the Treaty of Paris, Dec. 10, 1898, the United States gained the Philippines as a U.S. territory. Many in the islands were not eager to see one colonial power replaced by another. This desire for independence soon resulted in armed resistance against the U.S. 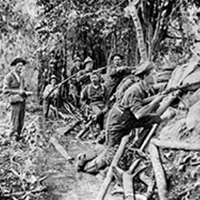 The Philippine Insurrection began with a skirmish on the night of February 4, 1899, just outside of Manila.